OAKLAND, Calif. (AP) Stephen Curry stood among the coaches during a third-quarter timeout pleading his case to keep playing, and Steve Kerr relented – after a brief chat with the training staff, of course. And who could blame Curry? He was feeling it after waiting weeks to get back on the floor, even missing the marquee Christmas Day matchup against LeBron James and the Cavs. 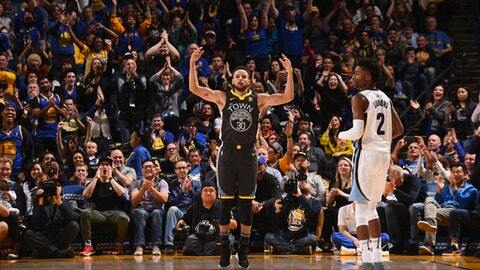 Curry made a sensational return from injury by scoring 38 points with a season-high 10 3-pointers, and the Golden State Warriors beat the Memphis Grizzlies 141-128 on Saturday night with an energy and spirit that had been missing much of this month without him. Curry shot 13 for 17 and 10 of 13 from deep in just shy of 26 minutes for his ninth 30-point game this season after missing 11 games with a sprained right ankle. His mere presence brought an energy to the Warriors and all of Oracle Arena, and he spent much of the fourth quarter pacing, gesturing in delight while cheering his teammates with a towel draped over his head. Kevin Durant added 20 points, nine assists and five rebounds, and Klay Thompson scored 21 points as the Warriors wrapped up nearly three weeks at home in California. Zaza Pachulia scored a season-best 17 points and also had eight rebounds and six assists. Marc Gasol led six Memphis players in double figures with 27 points on 10-for-13 shooting. With his parents, wife and two daughters in attendance, Curry got his first points on a layup at 10:27 that put the Warriors out front 7-0 and led to a Memphis timeout. He hit a 3-pointer at 9:52 before Memphis scored its first points. Curry received roars from the sellout crowd during pregame introductions, and Durant threw his right arm into the air to cheer his pal’s comeback. In the game’s closing minutes, Curry hit a 3-pointer, held his follow-through and jubilantly hopped up and down on his left foot. At other moments, he pounded his chest. This marked Curry’s ninth career game with 10 or more 3s, most by any player in NBA history. Curry was all smiles during pregame warmups. He hoisted his signature tunnel shot, signed a few quick autographs when daughter Riley arrived to greet him and briefly held his arm around her before turning around to do his customary hallway sprint. His little girl cleared the way, and off her dad went to the locker room. He’s healthy at last – and it showed immediately. Kerr had hoped to play his star 20-25 minutes, and Curry hit another 3 just 30 seconds after conferring with the coaching staff during that timeout with 4:36 left in the third. Memphis lost here 97-84 on Dec. 20, then watched the Warriors match their season high for points in a half this season by leading 78-67 at the break to the delight of the fired-up crowd. Draymond Green was ejected with 9:45 left in the second quarter after a second technical foul in a 43-second span. Both were for arguing. The emotional forward has been ejected twice this season. Green had five assists and three points in 10 minutes. Grizzlies: The Grizzlies’ 67 first-half points were their most in any half this season, while Golden State’s 78 matched the most points ever allowed in any half by Memphis – with Golden State also scoring 78 on March 24, 2010, on its home floor. … The Grizzlies are one of two teams along with San Antonio to own a winning regular-season record vs. the Warriors since the start of the 2011-12 season at 13-12. … Memphis completed a strange stretch in which it played at Golden State on Dec. 20, at Phoenix the following night, home on Dec. 23, back to Phoenix on Tuesday, in Los Angeles against the Lakers on Wednesday then returned to Oracle Arena on Saturday. Warriors: The Warriors’ 141 points are the most scored against the Grizzlies ever by any opponent. … Golden State’s 14 first-quarter assists – for 40 points – were one shy of the franchise record of 15, done three times. … The Warriors improved to 8-0 after a loss this season. Golden State is 40-7 since 2014-15 following a defeat. … The Warriors went 13-2 in December and finished 5-2 on this season-long homestand. The 13 December victories match the franchise’s most wins in the month during their West Coast Era, also done last season. Grizzlies: At Sacramento on Sunday. Warriors: At Dallas on Wednesday after playing seven games at home over the past 11 days.